I know you can get blueberries all year, but I would urge you to run to the farmer's markets to grab the last of the blueberries. Nothing is better than farm fresh blueberries. This pie will work with blueberries any time of year. I mean...it's pie. So pie any time is good. I show you a lot in this video, which explains the length. 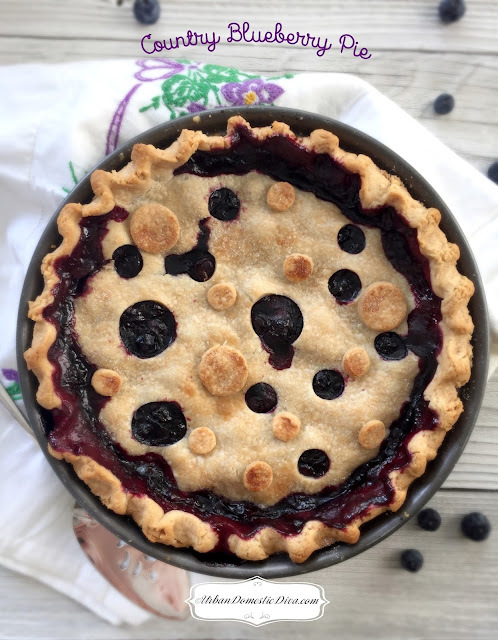 I walk you through making the crust, rolling it, how to store blueberries, how-to make a decorative crust, how to make a foil ring to shield the edges during baking. The crust how-to can work with any fruit pie and is a butter crust. So join me in the kitchen! In a food processor, pulse the dry ingredients. Add the cubed butter and pulse, only until small peas form. Add the liquid, and only add as much as you need until the mixture can be held together by pressing with your fingers with pulsing a little bit. Divide the mixture in half evenly and mounded onto plastic wrap. Using the plastic wrap and your fingers form each mound into a flat round disc. Wrap completely with the plastic wrap and chill in the refrigerator for an hour. At this point, you can freeze the dough for up to 3 months. The dough can be held in the refrigerator for up to a week. In a bowl, toss together all the ingredients. With the cornstarch being the last ingredient. Toss and set aside. Take the first disc out and let it sit out at room temperature for about 10 minutes until the dough is workable. In between two floured sheets of plastic wrap, roll out your dough to about 2 inches past the diameter of your pie pan. Once this is the right size, peel top plastic wrap, and flip over carefully into your pan. Peel the plastic wrap off the top and press gently into the pie pan. Trim overhang so that there's an even amount around the edge. Cover with plastic wrap and chill for one hour but not more than three. Next, roll out the second disc in the same manner. But this rolled out dough you're going to slip gently onto a flat baking sheet keeping it flat. Chill this dough for the same amount of time. Place a baking sheet lined with tin foil on the bottom most rack of the oven. Preheat oven to 425˚ and heat the sheet for at least 20 minutes before placing the pie in the oven. Pull out your chilled dough in the pan. Pour the blueberries into the pie shell, set aside. To your bottom crust, use some water on your finger to wet the edges of the pie shell. On the bottom shell, once you wet the edges, make sure the pie edges have softened a little at room temperature so that you can work with it, and pull them up from the sides so you can make a seam one you place the top crust. Set aside. Pull out the flat top piece of dough. Peel off the plastic wrap and create your decorative embellishments while it's still flat and cold, understanding roughly where the center is. Once you're done prepping the pie top, flip it over onto the waiting, filled pie shell by using the bottom plastic wrap (that is now on top) to help maneuver and center the pie top. Using your finger, find your pie edges over your top crust, pressing it gently. Cut the overhang evenly. Fold top edges into and over the bottom edges to seal the pie. Then crimp the sides with your forefinger and thumb. Sprinkle with granulated sugar on top. Place on the well heated baking sheet. At about the 30 minute mark check your pie and cover the edges with the pie shield or a foil ring to protect the edges while the center cooks. Overall the pie will take about 40 to 50 minutes to cook. You're looking for bubbly, syrupy fruit in all areas of the pie, especially the center. Let it sit and cool for three hours before serving. This was a "Fridays with Flora" episode from last week. If you want to keep up with the series, go to my youtube channel and subscribe! I would really appreciate it, and you won't miss out on any more projects!